Ever heard the expression, a plumber’s house always has a leaking faucet? Well, I have a confession to make, I’m that guy. Despite being in the electronics industry for over 20 years and knowing full well the importance of a quality network in the home, I’ve even trained companies on the subject, I am guilty of having an inadequate network, dare I say one that’s “off the shelf.” I have a very elaborate home automation system and all of the technology that goes along with it, and yet I’ve never taken the time to update the backbone of the system that makes it all work. For over 10 years our industry has been talking about the convergence of AV (audio video), and IT (Information Technology) and we’ve watched this gain momentum to the point now where almost everything is able to connect to the internet. And now even more content is becoming available as a streaming service. Just recently Apple announced their new Apple TV+ and Apple Arcade services and later this year Disney will be making their entrance into the streaming services market as well. With hundreds of new smart devices for the home coming out every year and streaming content becoming so easily available that no longer are we stuck with just a single local cable provider, or satellite, why doesn’t everyone have a high-quality network at home? Maybe complexity and cost of ownership? While the AV industry continues to struggle with having accredited education programs or trade schools, computer networking has been around for many years, largely driven by the critical importance of computers and networks in businesses worldwide. Over the past 27 years lower cost networking solutions have made up a majority of the products being used in the home, largely due to their simplicity and the lack of knowledge needed compared with more advanced systems that are best suited for those who spent the five years attending trade school to become a network engineer. Manufacturers have done their best to try and simplify the set-up requirements of getting a network up and running for the average homeowner and millions of “off-the-shelf” modems, routers, and wireless access points (WAPs or APs) have made their way into today’s common home. For the longest time, these products made it easy for the average homeowner to hook up their desktop computer to the internet, and maybe move throughout different rooms using a laptop. In the connected home of today, however, these types of systems just don’t cut it anymore. Homes have become larger, neighborhoods are closer together, more devices are connected, more people are streaming and downloading, and internet speeds are now in the gigabit range, which is over ten-times what they were not long ago. It’s projected that by 2021 the average North American home will have 13 connected devices, per person, and it’s estimated that by the end of this year, there will be nearly 27 billion connected devices installed worldwide. With this type of usage, why do we continue to look at the home network like a luxury and not as a utility? During my conversations earlier this year at the International Builder Show (check out that article here) one manufacturer had a clear focus and strategy to help change this perception and educate builders on the importance of the network in the home and why it should become a standard just like any other utility. That company was Luxul, which was acquired by Legrand back in 2016. Legrand is one of the biggest names in the manufacturing of infrastructure and technology products for the new home, so it’s no surprise they’ve taken this leadership position in the market. There are a lot of manufacturers who make networking solutions for varied sophistications and few product categories have more personal bias than the network. With all of your technology being connected to it, the network can often times be the difference between a happy customer or potentially days of troubleshooting, so the debate over who makes the best stuff is highly contested throughout the industry. Some people spent the five years to become a network engineer and feel that anything less than an enterprise-grade network option is just not good enough. With my current need for updating my personal network I decided on Luxul, and I chose them for several reasons. I previously had sold Luxul products to custom integrators for many years and had a good understanding of their reliability, and support. I like what they are doing to help educate the market and make the network become more of a standard utility in the home, and Luxul has done a lot of things to help make it easier for authorized installers to get their systems up and running. So, I reached out to the company to learn more about their latest product offerings and find out what they recommended based on the size of my home and on the level of technology that I owned which would be relying on their network to give me the best performance. The timing was perfect as they had a new access point coming out and this would give me an opportunity to do some beta testing for them before it is released. Now, I should mention that Luxul is only sold to professional installers, and so while much of the experience I had would be more of what a custom integrator would go through, many of these benefits ultimately filter down to the homeowner and the ability for them to get a high-quality network, installed by a professional, for a reasonable price. The first step was to visit their website under their “Customer Assurance Program” and register my project as the installer. This process allowed me to document all of the devices I was hooking up, type of usage, internet service speed, the materials my home was built with, and even allowed me to upload a floor plan, which I will explain a bit more later. This is a free service for custom installers that is very valuable for both the dealer and the homeowner. To have the manufacturer working closely to better understand the project that their equipment is being used in, can help create a better solution in the end. This is also helpful should there be a problem later on as Luxul will already be familiar with the project making it easier to resolve any issues in a timely manner. A couple additional features about the customer assurance program is that they guarantee the design they produce will perform both wired and wirelessly. If it doesn’t, they will make it right by providing any additional network equipment at no cost to the installer. And should you experience a product failure with their equipment, they will provide an advanced replacement for all of their Luxul products. Meaning that you won’t need to have someone come out several times to remove the defective part, only to return at a later time to reinstall it. This saves everyone time and money. 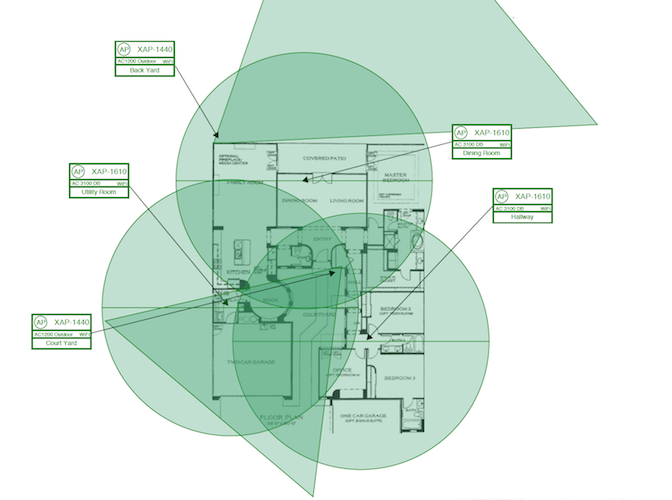 Within 24 hours of submitting my information, I received a design package that included the floor plan I provided and showed the optimum locations for the installation of my interior and exterior access points. It also included a detailed list of the equipment that I would need with the retail pricing, a line diagram on how everything would connect, including recommended VLANs, a copy of their three-year hardware warranty, product overview sheets regarding their software partners router limits, Domotz remote monitoring, some helpful best-practice suggestions, and cutsheets for each of the products they included in my design. As an installer, this would have been a great package to hand over to my customer, so they could see what they were getting for their network, along with seeing the support that I was receiving from the manufacturer to ensure they get the best performance while giving the customer greater peace of mind. The system that I went with, based on Luxul’s design, provided me with a new gigabit router, a wireless controller, a POE (power over ethernet) switch, three wireless access points for inside, two for outside, and enough PDU products to plug all of my equipment in and be able to manage each electrical outlet (more on that later.) While I could have been fine without the outdoor access points, I decided to go with them anyway because I wanted to make sure I had good network coverage in both my front and back yard. 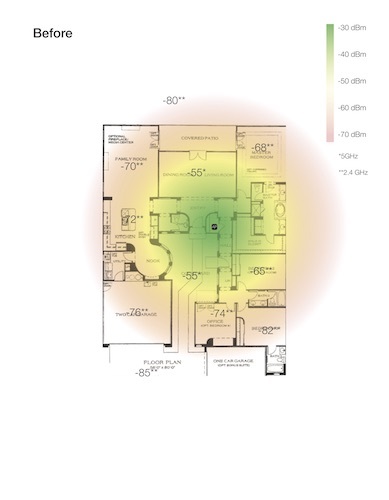 Since the outdoor access points are directional (versus the omnidirectional indoor WAPs), this would ensure that I had the coverage I needed specifically in the exterior locations I desired. My old system only had one access point, which was not uncommon for network systems when it was installed, and one of the problems my family experienced was that despite showing a connection to the Wi-Fi on my mobile device, the internet would be too slow to use and I would have to switch the Wi-Fi off or move somewhere else in the house to get the internet to work. For me, it was important to have multiple access points that would allow for active roaming. In the past, when you couldn’t install the access point in the center of your home, or needed more coverage, you would add a Wi-Fi extender, which would allow your device to jump between your access point and extender depending on your signal strength. This concept has evolved a bit, and today there are packaged systems from several companies that bundle these items together and sell them as a low cost “mesh” solution with the advertisement of providing whole-home wireless coverage, and they do…well kind of. The problem with off-the-shelf solutions such as these is that they rely on each of your devices to control the connection to the various access points and repeaters throughout the home. Most devices, especially cell phones, tablets, and laptops are designed to connect to a network and will stay connected to that network until it is no longer within range. When you start to introduce additional repeaters or access points, the devices can get confused and create a “sticky” connection in which the device is trying to hang on too long to its original connection because it doesn’t realize that there is another connection with better speed and signal strength nearby. To address this problem, the commercial world has been using wireless network products from companies like Cisco and Ruckus for many years to provide active roaming. 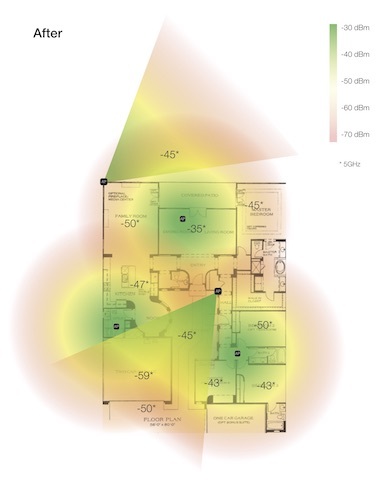 Active roaming utilizes a controller that manages all of the access points on the network and all of the devices. It knows the needs of your device, and it makes sure that you are getting the best signal and download speed possible, regardless of where you are on your property. This is a much smarter and more reliable approach than depending on each of your devices to try and figure it out. For this reason, many of the largest homes with the biggest home automation systems have used these commercial-grade solutions over the years. The challenge has been that these systems are far more complex and require special certification and licensing to be able to have access to them. While this is a great way to ensure that these high-quality products are properly installed, this does end up adding additional time and cost to the purchase, and for many homeowners the sophistication of these enterprise-level systems is not needed. Luxul and others have made it possible to have a system with the functionality needed for the highest levels of technology in the home while also making it easier and more affordable for more people to own. They still require training for their authorized installers, but it’s not at the level that companies like Cisco would require. This is not to say that Cisco and Ruckus do not make a great solution, they do, but for many projects would do just fine with something a step below. That being said, if money is not an issue, why not go with the best as long as it is being installed and programmed by someone who is truly certified for those systems? My POE (power over Ethernet) switch also included a self-healing feature. With the Luxul PDUs installed, any electrical device with a network connection could be rebooted should the network signal go away, but that doesn’t help with products that are powered over the Ethernet connection. For me, this would be products such as my security cameras, VoIP (voice over IP) phone, wireless access points, and the touchpanels for my automation system. With the self-healing feature of the POE switch, if there seems to be an issue with a device being powered over Ethernet, the switch can reboot the unit and try to reset it. 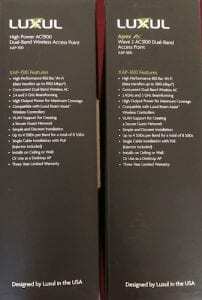 As I mentioned earlier, Luxul has partnered with two great companies that have embedded their software into the Luxul routers for optional use. The first is Router Limits, which can set access limits for content or control the hours of usage by device, and even allows you to track the browsing history of any device connected. So, if you wanted to make sure your child’s iPad couldn’t access social media websites or you didn’t want to allow streaming Netflix on your smart TV after 9 p.m. during the week, you can easily set these parameters. Some companies charge $99 per year for this type of service, but with Luxul it is free. Having a daughter at home, this sounded like a great added benefit of choosing this system. Another included software is Domotz. This is a full software suite of networking tools to help your installer have a better understanding of your network and to help troubleshoot problems remotely. With so many IOT (internet of things) devices in the home, such as Sonos, Amazon Alexa, and Nest thermostats, being able to understand what is going on in the network is more important than ever before. Domotz gives that visibility to the installer, saving even more time and money for the homeowner should a problem arise. There is a small fee, just like any type of maintenance program, but that will more than pay for itself the first time you have an issue turning on music for your holiday party right before everyone shows up to your house because there is an issue with the hardware or the network. With Domotz the installer would receive a notification at the time the issue occurs and can try to fix it remotely before you are even aware it, reducing stress as problems typically seem to happen at the most inopportune time. Before I tore everything apart, I checked my existing Wi-Fi signal strength and download speed at multiple points throughout my home, so I could have a baseline of my wireless performance. Getting started was easy, as each item had its own “quick install guide.” After hooking up the modem, router, and switch, I plugged in the controller, which promptly found the current model XAP-1510 access points. I decided to install these first to see how they compared with the new beta model XAP-1610s that I would be testing later. I liked how easy Luxul made it to have the access points auto-discover. They have even taken it a step further with their router/controller products, which are perfect for smaller homes. For these, they created an “easy setup” app, available on iTunes and the Android Marketplace that allows you to do the basic set up for their router/controller with the ability to add additional access points in about 90 seconds, and you don’t need to get into any of the menu systems on the router unless you want to do more advanced settings which again helps to speed up the install process. I also installed an assortment of Luxul’s Intelligent Network PDU products in both my rack room, and behind the televisions throughout my home. These devices reside on the network and monitor the network connection to the items plugged into them. In the event that the item plugged into the PDU stops reporting on the network, the PDU can automatically reboot the outlet and reset the device that is plugged into it, in an effort to fix the issue. They also provide surge protection, which is an important for any plugged-in electronics. This product has only been available from Luxul for the past year and while the form factor of each unit was great and the installation was easy, there were a lot of software features that were missing. For instance, I would like to see a consolidated web view or app, the ability to lock outlets so they couldn’t be shut off (only power cycled), and other features that are common for this category of products. I spoke with Luxul about these areas to improve, and they are working on a software release that will address them. Otherwise the hardware is very well designed. Please keep in mind that while Luxul has done a great job of making it easy to design and set up the network, depending on the size of the project there is still may be a lot of time required by a professional installer to design the rest of the system and determine how to make sure it all works together. There may also be the need for more advanced network programming, such as setting up VLANs or static IPs for devices that might be causing problems, or if you want to have more advanced security settings, or maybe a secured guest network. Luxul has made their products much easier than many of the higher-end networking manufacturers on the market, but there is still a reason why they sell through authorized dealers only and not direct to consumer. This level of system has a lot of great functionality that without proper training could cause your system not to work properly. With everything installed, it was time to do some testing and see how this compared with what I had previously. The first thing I checked was my signal coverage. With so many more access points, I expected it to perform better than only having one, but would it provide the coverage like the design showed me from Luxul. Signal strength is measured in dBms (decibels in relation to a milliwatt) usually on a scale of -30 to -100 with -30 being amazing, -60 being very good, -70 being okay, and once you get past -75 you can expect significant degradation in speed and performance. With my original access point installed in a closet, close to the center of the house, my network signal was between -44dBm and -55dBm throughout a small coverage area that unfortunately was not an area in which we would ever be using a wireless device. As I went into common areas, such as the living room, I was at -70dBm, the kitchen was at -72dBm, the master bedroom was at -68dBm, and my office was at -74dBm. This would explain why I was having so many issues. Despite my cell phone and laptop always showing a good connection, clearly, they were not providing a true representation of what was going on. With the new Luxul system installed, I am now getting -35dBm to -60dBm everywhere, including outside. And, because of the active roaming capabilities, I am rarely ever in a spot where it drops below -65dBm because the system is smart enough to switch me seamlessly, without me ever knowing. This was the type of upgrade I needed, and the coverage was everywhere. For many years I have been upgrading my internet plan with my ISP in hopes of increasing my internet and streaming performance, and while it seemed at times that things improved over the years, ultimately, I knew that it was my networking equipment that was keeping me from getting my money’s worth from my monthly bill. 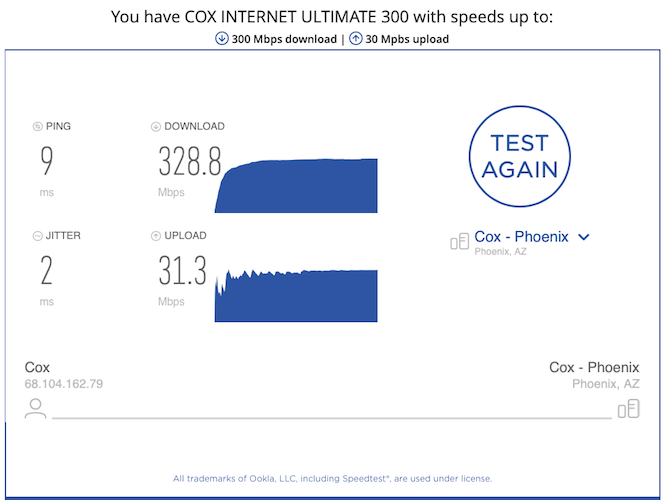 My current Cox Internet Ultimate package provides speeds up to 300 Mbps download and 30 Mpbs upload. Unfortunately, I was averaging download speeds of 45Mbps to 90Mbps throughout the house, and some areas were as low as 32Mbps, meaning I was getting only a 1/10th to a 1/3rd of what I was actually paying for, and upload speeds were not much better. Now, I am averaging 220Mbps to 260Mbps download speeds everywhere and even exceeding 300Mbps, depending on the device, while consistently achieving 30Mbps upload. With this system in place, I could upgrade to the latest Gigabit plans available from my ISP and have some of the fastest internet around. Now that the system was up and running, it was time to try out the new XAP-1610 access points, which will be shipping around the time this article is released. After shutting down my network and installing the new access points in the place of the previous ones, I fired the system back up. One of the new XAP-1610 access points was recognized by the controller right away, but unfortunately the other two wouldn’t connect. Stuff like this is not uncommon with these still being in the beta testing phase. I called tech-support to make them aware of the issue, and they were able to help me log in to the access point directly and find the controller. They have assured me that this would be fixed by the time the access points came to market. While at first glance it seemed to be the same as the XAP-1510s, a closer look with some testing equipment showed the difference. 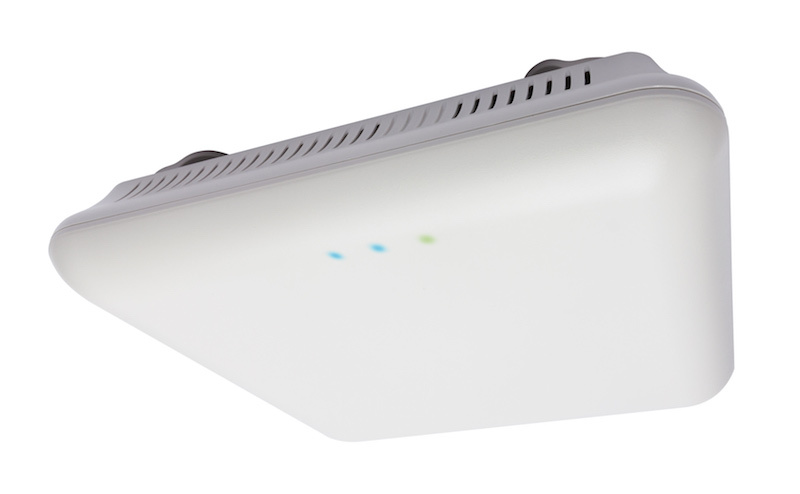 The new models are the first from Luxul featuring a 4×4 antenna with MU-MIMO (802.11ac Wave2) technology, and they are the only manufacturer in the custom installation industry to do this. This technology results in higher network speeds in medium-to-weak signal ranges, as well as better ability to manage the needs of up to 128 devices at a time ensuring high-bandwidth to each device all at once. With the Wave 2 technology, they are able to deliver data rates as high as 3100 Mbps compared with 1900 Mbps of the previous model. Of course, this is dependent on having a device that has the same Wave 2 technology built in. Currently there are not many devices with Wave 2, so your current iPhone, Amazon Fire, etc. will not be able to take advantage of this performance difference. But, as newer versions of hardware come out, these new access points will be ready to deliver the optimum performance. What I did notice was an improvement in 5GHz range and speed. My phone was not jumping to 2.4GHz as quickly when I got to the outer range of the access point. There was definitely an improvement, but more importantly, since I am just updating my network now, I want to future-proof my system as much as possible, so I don’t have to upgrade again in the near future as the number of connected devices grows in my home. The real test is living with the system. The numbers sound great, but once the testing tools are put away, how does the system truly perform. After living with the system for a week, I can say that the issues my family used to experience in having to shut off the Wi-Fi to use an app or stream a movie are gone. Moving photos from my computer to the cloud or server are substantially faster, and the best part about it is that I finally have a network that is built to support the rest of the smart devices, automation products, and streaming sources to provide my family with a more reliable and better experience in the future. As I mentioned before, the network really should be viewed as a utility, just like we view water and electrical. With data speeds coming into many homes throughout the U.S. at gigabit speeds, and the average home having so many products that require a fast-reliable network, the need for having more than a consumer grade network in your home is no longer a luxury, it is a necessity. Companies like Luxul are making it easier for installers and homeowners to have access to these types of systems at a much more reasonable price than before. 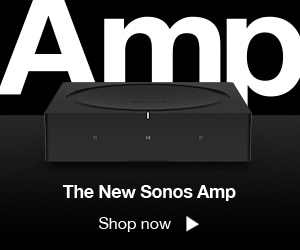 So, if you are like me and haven’t replaced that old, off-the-shelf, consumer-grade network in your home, don’t go buy the new and latest version of an outdated technology. Reach out to your local custom integrator and ask them about a site assessment and upgrading your system today. Trust me, it’s worth it! Gordon Isaac is a veteran sales leader with nearly 25 years of experience in the technology industry. He focuses on culture and building successful teams, which get results that make companies grow. 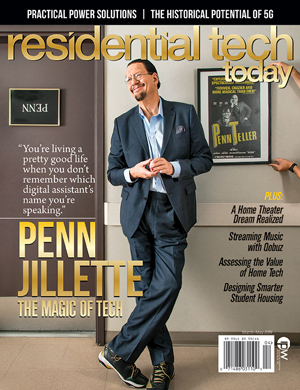 © Residential Tech Today 2019. All rights reserved. Your information will only be used to send you great content and offers. No thanks. I don't want free content.